Landscape drawing is a great way to teach students how to create the illusion of space. It is also a good way to introduce students to chalk or soft pastels. This lesson is great for beginning artists in a high school or middle school level. Overview and Purpose: Students will review the use of several factors to create the illusion of space in a 2-D image. Students will learn to use color to create the feeling of a particular mood. Students will review the use of chalk pastels in the creation of artwork. Objectives: The student will learn the relationship between color and mood. The student will review concepts necessary for creation of the illusion of space on a 2-D surface. 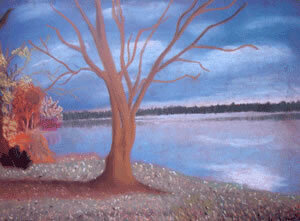 Students will learn the relationship between horizon, background, middleground and foreground. Students will review the successful use of chalk pastels on paper. Delivery of info: Students will be presented with a power point presentation that explains the relationship between color and mood in artworks. Students will also review space in the power point. The creation of the illusion of space through color, placement, size, overlapping, perspective, and amount of detail. At the end of the power point, the teacher will add tips on using the pastel, such as… Layering colors, mixing colors, having some blended areas and some areas that are not blended. Students may also watch Pastel Landscape Video Demonstration . Students will work from their own photos.